Book presentation and conversation with Otto E. Rössler during the Rundgang 2010 at UdK Berlin. On the occasion of the open conversation series Otto’s Impossible Talks: Impossible Topics / Rescued Futures with Otto E. Rössler during the annual exhibition at the UDK 2009 and the related exhibition Let’s Start to Implement Little Errors by the Institut für Raumexperimente, 22-29 May 2010. 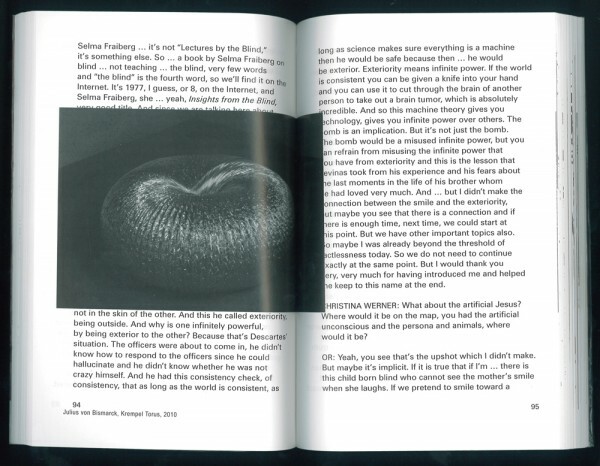 Are there connections between the artworks of the participants and the far-reaching topics presented by the controversial chaos researcher Otto Rössler? If there are connections, can they be identified and made visible? Can they lead to interesting, dynamic relationships rather than merely formal relationships between art and science or space and perception? The publication Otto’s Impossible Talks / Let’s Start to Implement Little Errors answers in the affirmative and offers various attempts to realize these connections. However, these relationships are controversial and reveal tensions. They do not have clearly defined borders or edges; they are striated, not smooth. Images and text overlap each other, complement and limit themselves. Otto’s Impossible Talks / Let’s Start to Implement Little Errors refracts the dialogue to the exhibition experiment in order to understand relationships and connections as well as different processes that emerged between Rössler’s lecture Otto’s Impossible Talks: Impossible Topics / Rescued Futures and the exhibition Let’s Start to Implement Little Errors.